Eskes, Bertus, Dario Ahnert, Luis Garcia Carrion, Ed Seguine, Sophie Assemat, David Guarda, and Patricia Garcia R. "Evidence on the Effect of the Cocoa Pulp Flavour Environment during Fermentation on the Flavour Profile of Chocolates." In: 17th Conférence Internationale sur la Recherche Cacaoyère, Yaounde, Cameroun, 15 - 20 Octobre 2012. COPAL. s.l. : s.n., 20 p.
The research here observes the impact the fruit of the cacao has on the the final flavour of the cocoa nib (or seed). Do flavours contained within the fruit influence the flavours within the seed, and do these flavours carry on into the final chocolate product? Most often, the chocolate makers and growers pay attention to the cacao seed in regards to determining the flavour potential of the chocolate. Depending on the genome of a cacao tree, its seeds may contain an array of aromatic molecules; some of which are favorable (cocoa, nutty, butter, berry) and some unfavorable (astringent, burnt, sour). However, it’s difficult to know for sure until the seeds are processed and turned into chocolate. The researchers suggest there is a great deal of information one can gather from the flavour of the cacao fruit, and its link to the flavour of the cacao seed. It’s believed the fruit pulp can, to a degree, dictate the flavour quality of the cacao seed and the corresponding chocolate. For example, if the cacao pulp tastes fruity and floral, there is a good chance the chocolate may contain those flavours as well. This research goes back quite a few years now, but it was one of the first of its kind, and is worth taking a look at. Of course, more research is required to be more certain about all the suggestions, but the study here offers up interesting ideas nonetheless. Chocolate is made from the kernel of the cacao seed. When cacao is harvested, the seeds are surrounded by the fruit of the cacao. The farmers living in tropical countries who grow cacao get to enjoy the flavour of this fruit, something many of us 20 degrees North or South of the equator never get a chance to enjoy. The fruit is used as the basis for fermenting the cacao seeds, a crucial step in developing the flavour of the seed before it’s processed into chocolate. There are many varieties and clones of cacao, just as there are many varieties of grapes and apples. I’m sure you’re aware of the importance genetics play in offering up grapes and apples of very different flavours, and cacao fruit is no different. However, if chocolate is made from the seed and not the fruit, how important can the flavour of the fruit really be? This is what Albertus Eskes and his fellow researching team decided to delve into. When propagating cacao today, one must consider many genetic factors such as yield, resistance to disease and pests (a massive hurdle for most farmers), and last and often least, flavour. Selecting for flavour is least important because it’s not often as profitable to the farmers as selecting for greater yield and resistance to disease. However, many farmers now are being encouraged to grow flavourful cacao for the booming bean to bar chocolate sector. Chocolate makers and brokers are willing to pay these farmers a premium for their cacao if it offers up better flavour than bulk cacao. Figure 2: Balancing the important factors when propagating fine flavour cacao (Illustrated by Geoseph Domenichiello). However, trying to balance all these genetic factors while creating a fine flavour cacao is time consuming and costly. The Pre Columbian Mesoamericans spent years fostering their cacao into the fine flavour varieties many seek today. This research paper and those involved seem to believe that one shortcut to is to pay more attention in regards to cacao flavour is the fruit! It makes sense if you consider the idea that humans were likely eating the fruit of the cacao long before chocolate was invented. And if they were transporting and growing these trees, they likely selected for the most flavourful. Let's take a look at what the researchers discovered. 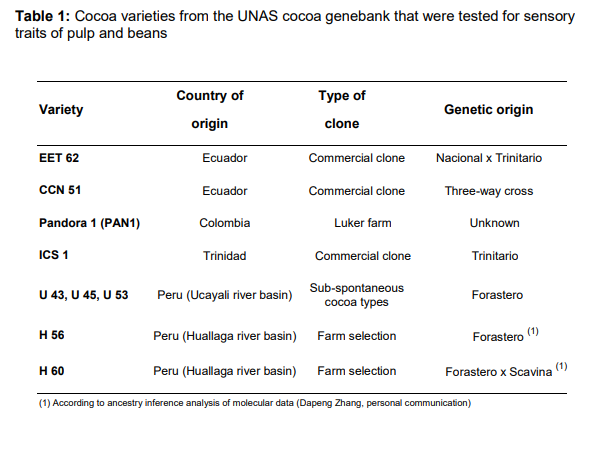 The fruit flavour of 9 clones of cacao were compared and contrasted at the cocoa genebank of the Universidad Nacional Agraria de la Selva in Tingo Maria, Peru. The 9 tree clones varied genetically, as well as geographically from where they were collected. The researchers observed how the fruit flavour related to the known flavour traits of cocoa bean and chocolate produced from them. Within the chocolate and cacao industry, certain varieties or clones are known for specific flavour traits that often end up in the final chocolate product, and become highly regarded or sought after. The clones observed included: EET62, CCN51, PAN1, ICS 1, U 43, U45, U53, H56, H60. You can refer to Table 1 to get a better idea of what these clone names represent. Although these names may not carry much meaning for you, they allow more clarity for the farmers so that they may propagate trees that are more desirable. In the past, varieties were named according to morphological differences, not based on genetic analysis, and led to confusion. The overall most preferred pulps were also rated highest in flavour intensity, odour, and sweetness of the pulp. Those with the most intensely flavoured pulp were also the most sweet and contained the greatest odour intensity. EET 62, PAN 1, and ICS 1 were the most intense in pulp flavour. While CCN 51, H56, H60, and U53 were considered the least intense in pulp flavour. Very acidic and astringent pulps tended to correlate to beans that were also more bitter. If the pulp was very sweet, it generally wasn’t very acidic, astringent, and the seed wasn’t overly bitter. Pulp preference, odour intensity, and pulp flavour were not significantly correlated to acidity, astringency, or bean bitterness. For instance, the fruit pulp of U 45 had a low overall preference score, but it was also low on acidity, astringency, and bean bitterness. So although high levels of astringency, acidity, and bean bitterness are generally not favorable traits, low levels of these don’t necessarily translate into overall more favourable fruit flavour. It’s also interesting to note that the seeds from U 45 (not favorable in regards to fruit) were even less bitter than the beans from EET 62 and PAN 1 which were the most overall prefered. Therefore, this study didn’t observe that favourable fruit pulp indicated a less bitter seed. A low level of bitterness in a cacao seed is a very desirable trait (the criollo and nacional varieties are known for there desirable seeds that are not very bitter). The fruit: The pulp from this cacao had the highest overall preference. It had the strongest odour and flavour intensity, lowest acidity, highest sweetness, very low astringency, and average bitterness of the bean. The cocoa: The seeds of this clone are known to also contain fruity and floral notes, and considered a fine flavour cacao bean. The fruit: This was the second most favorable, also with higher pulp flavour intensity. Although most of the fruit pulps tested were said to be fruity in flavour, PAN1 appeared to be distinct, tasting like soursop (a tropical fruit, also known as guanabana). It also has a relatively high level of both sweetness and sourness, which are also attributes of the soursop taste. The fruit: These were rated in the upper half of the scale in regards to overall preference. All these pulps were considered fruity, and had relatively good odour and flavour. U 53 appeared to be quite sweet and very low on astringency and bean bitterness. In fact, the seeds of PAN 1 and EET 2 were more bitter than U 53, even though they were more prefered overall. ICS 1 pulp was considered middle ground, being closer to the mean in many aspects, although somewhat higher on the acidity scale. Although acidity and sweet traits often opposed each other, the ICS 1 had considerable levels of both. The paper suggests that because ICS originated in Trinidad and is a cross between criollo (sweet pulp) and forastero (acidic pulp), it retained a combination of the two traits in its pulp. The pulp of the Ucayali clones was quite sweet, while also being very low on acidity and astringency. The fruit: These were in the lower half of the scale in regards to overall preference. The pulp flavour was still described as fruity, but intensity and overall preference seemed to be rated much lower. H 60 was quite acidic, astringent, and not too sweet. U 45 wasn’t very acidic or astringent, with average sourness, yet overall didn’t appear to be very flavourful. The Fruit: These clones appeared to have the least pulp flavour, odour, and were quite acidic. CCN 51 was also quite astringent, with H56 being moderately astringent. However, the seeds of the CCN 51 were the most bitter, almost double the bitterness of EET 62. Cocoa liquor (cocoa nib paste) made from CCN 51 seeds is often described as acidic and astringent. Three of the taste judges described the flavour of CCN 51 as not really having any prominent aroma or flavour. CCN 51 was a clone developed for greater yield and resistance, but failed in regards to flavour. One often comes across other chocolate enthusiasts spewing hatred towards the CCN clone. They appear to be bitter about it. This study suggests that the pulp of varying clones appear to be vary according to their genotype, and are significantly related to the known flavour qualities of their corresponding seeds and possibly the chocolate produced from these seeds. Understanding this relationship may help growers select for fine flavour cacao by screening the pulp and analyzing its flavour qualities. On one side of the spectrum, the fruit of EET 62 is highly favorable and its seeds are known for their potential to produce high quality and flavourful chocolate. On the other end of the spectrum, the fruit of CCN 51 was flavourless and undesirable, and its seeds are also known to produce poor tasting chocolate. But how would the cacao pulp flavour affect the flavour of the seed inside? There a barrier (the testa) that surrounds the kernel and separates it from the surrounding fruit. They suggest that the aromas from the pulp may pass through the testa and into the cocoa seed via the micropyle during fermentation (see Figure 1). Rohsius et al. (2006) states that the micropyle (a minute hole in the testa) becomes permeable during fermentation, allowing the products of fermentation (possibly including the fruit’s aromatic components) to enter the seed. Another hypothesis is that it’s possible the aromatic substances present in the beans are also present in the pulp. They suggest a further experiment where de-pulped beans with low fine flavour are fermented with the pulp of a rich flavour cacao, and vice versa, to see if particular flavours are is contained in both seed and pulp, or just in the plup. Although genes play a major role in the flavour potential of the cacao seed, it’s been observed that the environment and the process of treating the seeds greatly affects the final flavour of the chocolate as well. This leads into their next study, which altered the normal process of cacao fermentation by introducing fruit pulps from other species of tropical fruit. Study 2. - The addition of aromatic pulp to fermenting cacao seeds in order to improve flavour. Pulp from two tropical fruit species, cupuacu (Theobroma grandiflorum), and soursop (aka guanabana or Annona muricata), were added to fermenting cacao seeds of the amelonado variety. Amelonado is a variety that fell under the umbrella term “forastero”, and is associated with bulk cacao due to having less flavour and a high bitterness level of the seed. This amelonado was grown in a farm in Urucuca, South Bahia, Brazil. There were 5 treatments, all of which used the seeds of the amelonado variety, which had already been fermenting for at least 24 hours. One kilogram of those fermented seeds were removed, and placed into a polystyrene netted bag containing either cupuacu or soursop fruit pulp. The new mixture of cacao seeds and fruit pulp were placed back into the large mass and allowed to ferment for a full 6 days (144 hours). The Control: The amelonado seeds were removed from the mass 24 hours into fermentation, placed into a bag, and placed back into the mass of fermenting seeds. Cupuacu after 24 hours: The seeds were removed from the mass as in the control, but this time one kg of cupuacu pulp was added into the bag of cacao seeds and placed back into the mass. Cupuacu after 48 hours: The same as treatment 2, however the seeds removed were 48 hours into fermentation instead of 24. Soursop after 24 hours: Same as treatment 2, but with one kg of soursop instead of cupuacu. Cupuacu after 48 hours: Same as treatment 3, but with soursop instead of cupuacu. After the fermentation and drying of the beans, they were sent to Montpellier, France, where the nib (kernel of the seed) flavour traits were examined. They were then sent to Guittard Chocolate Company to be turned into cocoa liquors and chocolate, where their flavour was further examined. The results suggest that the flavour of the pulp environment has a direct effect on the flavour of the seeds, as well as the chocolate made from it. As well, it appears to be possible to modify flavours of cocoa nibs by adding aromatic substances during fermentation. The fruity flavour of the seed was stronger in the 48 hour treatment, likely due to the fact that the cocoa bean testa becomes more permeable later on, and perhaps the fruit added too early doesn’t get a chance to be absorbed before it to ferments and decomposes. This experiment suggests that growers could possibly enhance their profit by improving the flavour of their bulk flavour cacao. It allows them to use fruits grown locally to add to the fermentation processes instead of the added costs of propagating new trees. The main effect of the aromatic pulp was related to fruit flavour traits, not cocoa flavour or other flavours. Stronger flavoured fruits have a stronger effect on the nibs, cupuacu having a stronger flavour and a greater effect than soursop. Also the aromatic pulps seemed to reduce the cocoa flavour intensity as well. Why this occurred was not yet known. This included 4 treatments where they added 4 different fruit juices to a small batch of fermented amelonado cacao beans. After 48 hours, they added either juices of cupuacu, soursop, genipa (Genipa americana), or ginger rhizomes (Zingiber officinale). They were box fermented, and allowed to complete for 6 days (144 hours). The juices were added at 10% v/v (volume to volume), and the giger juice was 5% v/v. The nibs (kernel of the cacao seed) obtained from the samples containing fruit juice were surprisingly, or not so surprisingly, fruity in flavour, and the ginger juice batch produced nibs with a strong ginger flavour. No fruity or ginger flavours were discovered in the control. The nibs of the fruit bases were more astringent than nibs from the ginger juice. Why this occurred is not yet known. They suggest that the interrupted and modified fermentation conditions, such as removing the beans and putting them back, could have had an impact. However, it’s common practise in many parts of the world for growers to remove a portion of the cacao juice/pulp before fermentation, or hold the cacao pods intact for days before fermentation. Its stated that this pretreatment or reduction of the cacao fruit leads to less acidic and overall improved flavour of the cacao seed for certain varieties. Therefore if the removal of a portion of the fruit can improve the flavour of the seed for some types of cacao, then perhaps adding additional fruit (as occurred here) would certainly have the opposite effect of removing the fruit. So although fruit flavours were transferred to the seed kernel, the addition of fruit perhaps also added a cost to the flavour quality as well, leading to astringency. The outcome of these studies suggest two main ideas: that the flavour of the fruit can be a shortcut way to determine the flavour quality of the beans (to a degree), and that poor flavour beans could be salvaged by adding aromatic substances at the right point during fermentation. Study 1 observed that there is some significant correlation between favorable fruit pulps and the quality of the seed, but some correlations were not as significant, such as overall preference and bean bitterness. Study 2 observed that one can alter the flavour qualities of fermenting cacao beans by adding aromatic substances, which can help improve the flavour of some cacao growers are selling. However, it appears from these experiments that adding some positive aromatic elements also has negative implications such as increased astringency and possibly lower cocoa flavour. Since this study, many growers around the world are altering the fermentation processing by adding fruits or even other yeasts to alter the flavour of the seed. Since a great portion of the worlds cacao is not the fine flavour varieties harvested by the Mesoamericans, it's worthwhile for the growers and makers to invest their time into adjusting the processes in order to improve flavour. The fruit of the cacao is something that is only now slowly receiving attention in the mainstream market. Repurposed pod out of Pennsylvania, is producing cold-pressed 100% cacao juice from their trees in Ecuador. I've used this product many times in my workshops, to give people a chance to try a cacao product some never even knew existed. If you are unable to try the actual cacao fruit, this juice may help you understand why the first humans were attracted to this fruit when they first encountered it over 10-15 000 years ago. Newer PostRoasting conditions & polyphenol levels in cocoa beans.